Roots work days are generally held on the first and third Saturdays of each month from 9:00 AM - 4:00 PM. When a work day falls on a three-day weekend, the work day is on that Saturday rather than Sunday. The public is welcome to tour the collection at no charge during work days. Roots of Motive Power began in 1982 as a loosely organized group of friends in the timber industry who shared a love of local history and the antique machinery that shaped it. Working closely with the Mendocino County Museum, Roots volunteers embarked on an enthusiastic course of acquisition and restoration. Fittingly, the first project was the restoration of the Museum’s Murray Brothers spool donkey, a veteran of many years of service with Mendocino Lumber Company in Big River. Built on John Dolbeer’s patents in the 1880s, the veritical spool donkey represented the earliest attempts to mechanize logging. 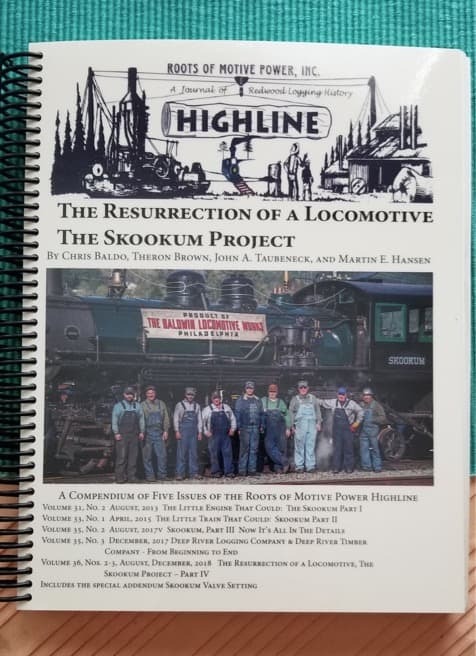 From this symbolic beginning, Roots volunteers moved quickly over the next few years to acquire and preserve steam equipment and other logging artifiacts of historic importance. Roots has collected a very complete blacksmith shop, several period machine shop tools, and has a Research Library of early steam and logging engineering. Roots collection of antique logging and railroad equipment comes to life several times each year during special public events, but our largest event is the annual Steamup. Roots of Motive Power is a 501(c)(3) charitable organization. The Board of Directors is elected for a one year term by the membership each August at our Annual Meeting. After their election, and also during the Annual Meeting, the Board selects officers, whose terms of service are also annual. The current year runs from August 2013 to August 2014. Never miss any updates from the Roots of Motive Power. Subscribe to our email list to receive all the latest information.